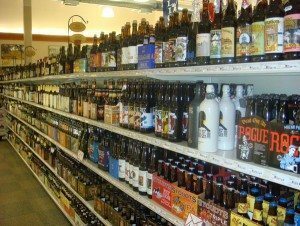 Whether you need a delivery for your next corporate event or large party, or just want your selection of craft beers waiting for you when you arrive at the store, Colonial Spirits offers one of the best beer selections in Massachusetts. Check out our Beer Discounts. At Colonial Spirits we love craft beer. We've been a market leader for more than 15 years and have a vast selection of beers from all over the world. There's always great deals on your favorites with monthly specials and our everyday 12-pack discount policy. Once a week we send out a newsletter devoted to nothing but beer. Within it, we offer our new release beers exclusively to our subscribers. Subscribe today and "Hop on the Bus." Colonial Spirits can get you the keg you want. If you have a special order for a hard to find beer keg, please contact us at least a week before your event so we can ensure we’ll have it ready to go the day you need it. However, we do stock a number of popular brands such as Sam Adams, Jack’s Abby, Sierra Nevada, and Budweiser. On Colonial Spirits’ beers of the world page, you will find beer from every corner of the globe. Our international beer selection is second to none. From German beer to beer from Belgium to a huge selection of American beer, beer around the world is our specialty. Beer can be as complex and unique as any wine, so check our beer tasting events page to see what brews we'll be trying at the store. On Colonial Spirits of Acton's beer blog page, you will find posts from our team of beer experts. Topics range from trends in the beer industry, appreciation for and personal recollections of craft beer, and debates on the right amount of hops needed to make the perfect brew. Colonial Spirits of Acton prides itself on its amazing selection of beer. Our beer store carries every kind of brew, from craft beer to imports to all of your favorite domestic brands. See all of the beer we carry on our Beers of the World page. You can also buy beer online from Colonial Spirits. Check out our store's Beer Blog. On this page, our beer experts discuss anything and everything related to beer. We can order almost any keg you want. Just call (978-263-7775) or e-mail tim@colonialspirits.com to place an order. Please note, we only stock a limited amount of kegs in house. Special orders can be placed but require a few days lead time to secure the keg you want. Check out our beer kegs page for more information.